Colombian street artist GLeo adds detail to a flower on "The Original Dream." She used over 500 gallons of paint to complete the record-breaking mural. Take a drive through the north side of Wichita and you might notice some new faces. They live on the walls of buildings, under bridges and on other structures that weren’t necessarily designed to be painted, but were anyway. Minjarez is behind Horizontes, a project that’s brought more than 20 new murals to Wichita in the past two years. Most recently, the project has become known for its capstone piece: the world’s largest mural painted by a single artist. Imagine standing next to a football field propped up on its side: That’s how big the Beachner grain elevator is. The dull grey structure at 21st Street near I-135 served as the canvas for the sprawling painting. Facing east, the mural gets to watch the sunrise every day. The Beachner grain elevator on 21st street is home to the world's largest mural painted by a single artist. Similar to most of the other Horizontes murals, it depicts the history of people of color inhabiting the Wichita area. Horizontes, or “horizons,” was awarded $100,000 from the Knight Foundation in 2017. The goal: to bridge the gap between two underrepresented communities in north Wichita. Train tracks, grain elevators and I-135 stand between the two communities. At over 50,000 square feet, the mural is expected to break the Guinness World Record. Minjarez said he's still waiting on an official confirmation from the company. Wichita’s North End neighborhood started about 100 years ago, when Mexican immigrants came to Kansas to work in the feedlots and meat packing plants in the area. Around the same time, on the other side of the tracks, many African-American families were coming to Wichita during the Great Migration from the South. They originally settled near the downtown area, but were later displaced and relocated in what is now northeast Wichita. Because of segregation, people of color were not allowed to participate in the commerce and social life that the city had to offer, Minjarez explains. They created their own cultural hubs within their communities. But eventually, the construction of I-135 and desegregation caused the neighborhoods to dwindle. The grain elevators became not only physical, but psychological barriers between the two communities — and Minjarez wanted to change that. He said his idea for Horizontes came from watching two little girls play in the area, with the grain elevators in the distance. Minjarez is the director and curator of the Horizontes project. Horizontes is based on the work Minjarez has been doing in north Wichita for the past six years. So Minjarez went to work, searching for a person of color experienced in creating artwork on a large scale. He also did his research, sifting through museum archives and conducting neighborhood surveys. “We hired canvassers to go door to door with a questionnaire that focused on quality of life questions and asked people about their history in the neighborhood and what sort of things they wanted to see more of in the area,” Minjarez said. GLeo, a 28-year-old Colombian street artist, was chosen to paint the giant mural. Together, she and Minjarez envisioned what representation would look like for Wichita. The young woman in the center represents Wichita. The mural is titled “El Sueño Original” – “The Original Dream.” It illustrates the history of people of color inhabiting the area. The young woman in the center of the mural represents Wichita. Artist GLeo based the figures in her mural off of real people who have lived — and currently live — in the north side neighborhoods. Orange fish eyes dot the mural. GLeo often uses them in her work to represent the elements. “And five of them together in a triangle form represents the universe,” Minjarez said. 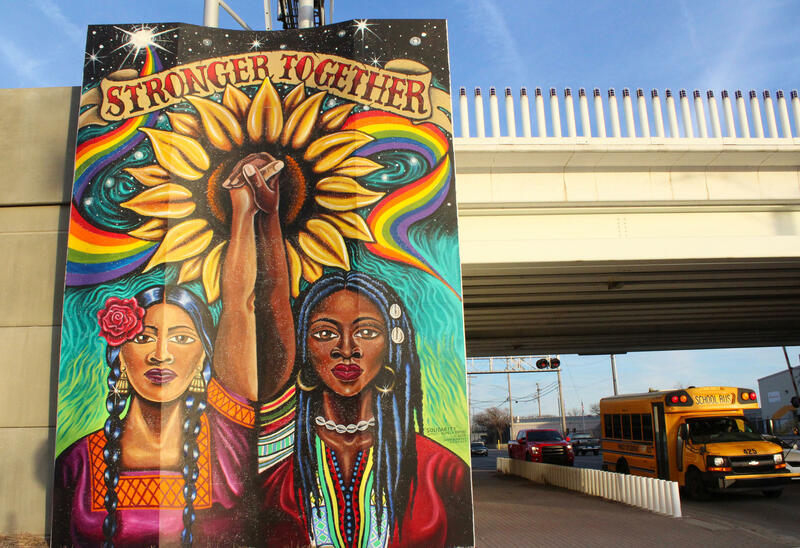 Among all of the murals Minjarez has curated throughout Wichita’s north side, there are about 65 different faces depicted — black and brown people, young and old, past and present. Some famous, and some who live and work in the community. Most of the murals have been painted by local artists who grew up or now live in the north side neighborhoods. Eaton's mural, "Solidarity," lives on the 13th street train bridge, facing the west side. Eaton said she hopes her mural will inspire children in the area to take pride in their community. On a chilly winter morning, Minjarez stands in front of the grain elevator and hand rolls a cigarette, his coat freckled with drops of paint. He was born and raised in Chihuahua, Mexico. 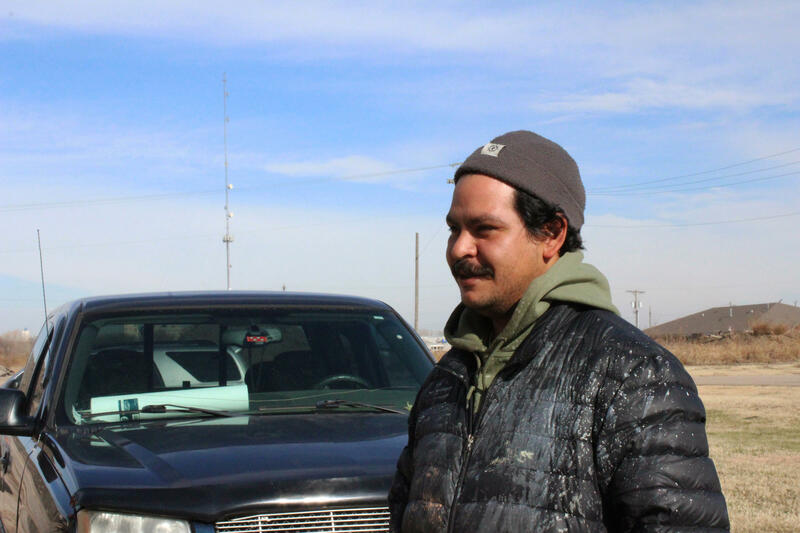 He moved to Kansas in 2001 as a teenager, and lived as an undocumented immigrant for eight years. To paint a mural is to tell a story. Horizontes is a story of identity and representation, and it’s one that’s far from over. 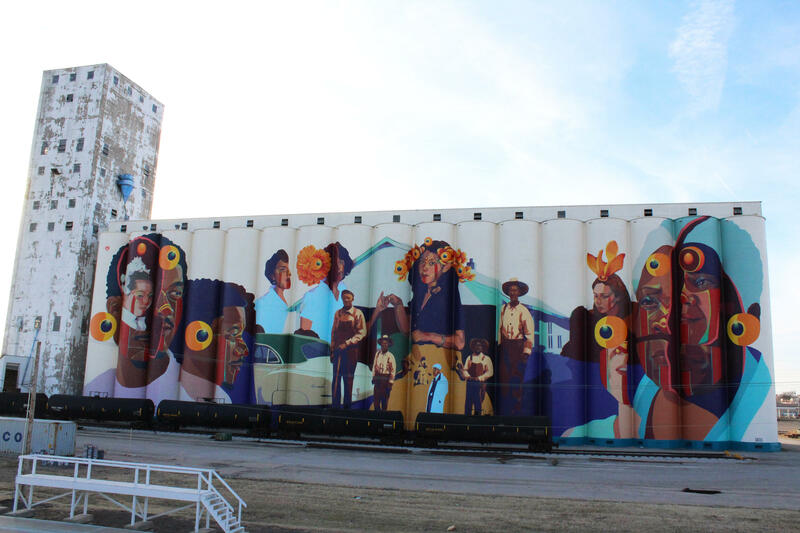 While the completion of the grain elevator mural marks the end of the project, Minjarez says it’s also the beginning of new opportunities for the residents of north Wichita, including the two girls he saw playing the day it all started. Ascha Lee is an assistant with KMUW's Engagement team and an intern with the KMUW News Lab. Follow her on Twitter @aschalee. To contact KMUW News or to send in a news tip, reach us at news@kmuw.org. 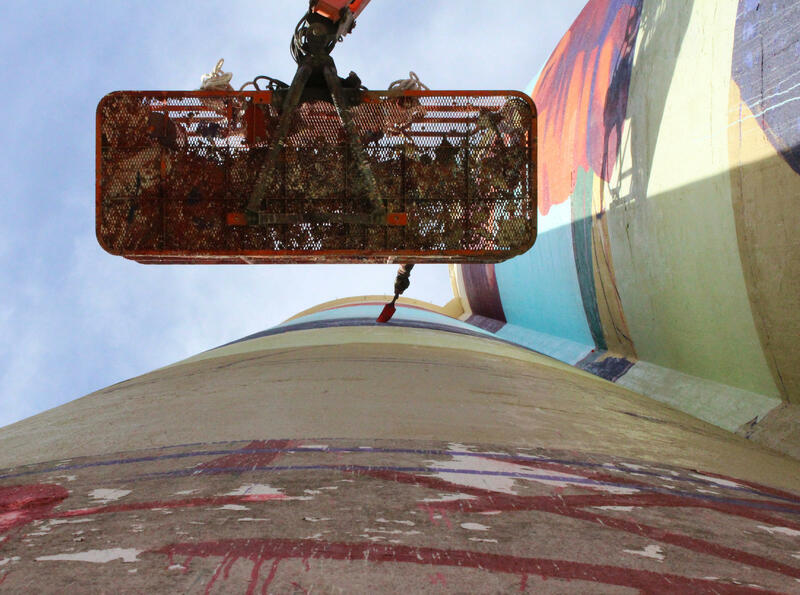 Wichita will soon be home to the world’s largest mural painted by a single artist. The mural is on the east side of the Beachner grain elevator on 21st Street. It’s visible west of I-135 as well as westbound K-96.